What a strange little book. Author Tony Abbott sums it up in this short paragraph towards the end of the book, "On the outside it doesn't look like very much happened. A burned girl was in my class for a while. Once I brought her some homework. In class she said my name. Then she was gone. That's pretty much all that had happened." That's exactly all the happened in the novel. Tom's class is uncomfortable when Jessica Feeney joins their class. Her burns make her an outcast, yet Tom is drawn to her. Seeing how the students interact with Jessica changes the way he feels about them, but he isn't sure if it is for the better. 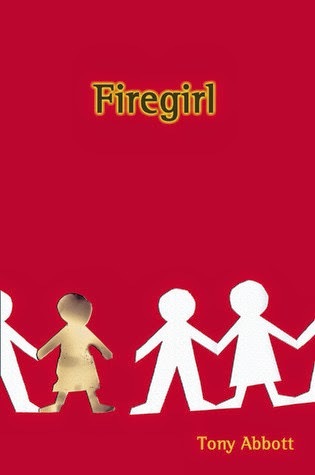 Firegirl is a heavy book and I felt nervous in my stomach the entire time I was reading it, waiting for something awful and dramatic to happen. When nothing did, I was relieved but also disappointed that really, nothing had happened. A student recommended this book to me last year, but I wasn't able to get my hands on it until now. I won't be passing the recommendation on, but I will let her know that I read it and am eager to see why she was so excited about it.